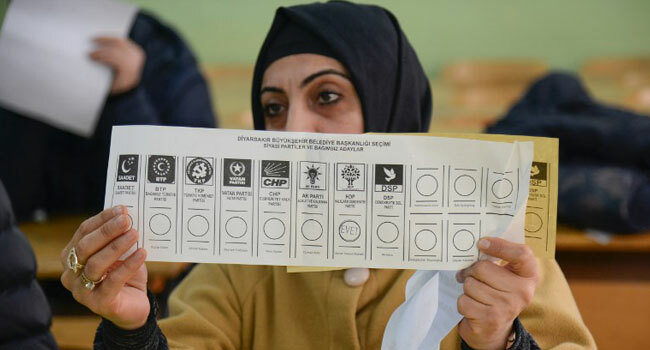 An election official shows a ballot during the counting at a polling station located in a school of Diyarbakir in southeastern Turkey on March 31, 2019. An election observer and another man were killed in a fight at a school-based polling station in eastern Turkey Sunday as voting got underway in Turkey’s local elections, the local governor’s office said. “Two of our citizens lost their lives as a result of a dispute at the ballot box around 10.00 am (0700 GMT)” in the Puturge district of Malatya, it said on its website. Security forces arrested four suspects in connection with the deaths, the governor’s office added. The violence took place as Turks voted in a grassroots support test for President Recep Tayyip Erdogan and his ruling Justice and Development Party (AKP). Experts say the AKP could lose Ankara, and even Istanbul, in the municipal poll. After voting in Istanbul, Erdogan said the incident had “upset” him and that an official investigation had been launched. “My wish is that no other incident like this happens again,” he said. The private DHA news agency reported the two men were shot after an argument between two rival political groups turned violent. The bodies were taken to a mortuary and police boosted security around the school where voting was taking place, the news agency said. The men were members of Saadet (Felicity), a religiously conservative party. One of them was an election observer. Saadet chairman Temel Karamollaoglu said on Twitter they had been “attacked” by an AKP candidate’s nephew at the polling station. Erdogan called Karamollaoglu to offer condolences, his office said, and vowed the culprits would face justice. Elsewhere, Istanbul police detained seven people after a fight between candidates for muhtar (a village chief) in the Esenyurt district. In a third incident, in Istanbul, a man was stabbed in the Kadikoy district on the Asian side of the city during a disturbance among local candidates, police said.